Are you looking for some inexpensive Christmas gift ideas? Here’s a few fun ones!! 2. Make a picture collage. My sisters and I made this collage for my dad on Father’s Day and it proudly graces the hallway of my parents home. Each grandchild held a letter in grandpa’s name(my kids are P and A). We made it black and white so we did not have to coordinate outfits or backgrounds or even be together. We each took our photos at home and emailed them to my middle sister who printed them and placed them in the frame. 3. Inexpensive Gift Ideas for Teachers, Pastors, and Sunday School workers. “Thanks for giving Sally a hand” tag with hand lotion. “Thanks a ‘latte’!” tag with a gift card from local coffee shop. A mug or bowl saying “You are ’souper’! – soup mix, custom decorated soup bowls or homemade soup. “You are out of this world” tag attached to a Milky Way candy bar. “You deserve an extra payday!” tag attached to a Payday candy bar. “There is no ’sub’stitute for you!” tag attached to a gift card for the local sub shop. “You are ‘extra’ special” tag with a pack of Extra Gum. “Thanks for helping Jimmy ‘bloom’” tag with a bouquet of flowers. 4. Make Cookie Jars. 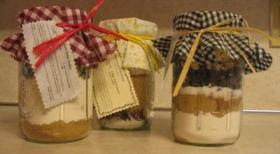 My friend Regina gave me these recipes and these are her cookie jars! Directions:Using a 1 quart or 1 liter jar, layer in the ingredients in the order given. Pack down the jar after each addition to make the ingredients fit. Put the lid on, and cover with an 8 inch circle of fabric. Secure the fabric over the lid using a rubber band, then cover the rubber band by tying a nice piece of ribbon or raffia around the lid. Attach a tag to the ribbon with the following instructions:Preheat oven to 350 degrees F (175 degrees C). In a medium bowl, cream together 3/4 cup of softened butter, with 2 eggs and 1 teaspoon of vanilla. Add the entire contents of the jar, and mix by hand until combined. Drop dough by heaping spoonfuls onto an unprepared cookie sheet. Bake for 12 to 15 minutes in the preheated oven. DIRECTIONS:Layer the ingredients in the order given in a one quart wide mouth canning jar. Firmly pack each ingredient in place. It will be a tight fit, but all ingredients will fit in the jar. Use pinking shears to cut an 8 or 9 inch circle from gingham, calico, or a seasonal fabric. Place the fabric over the wide mouth lid and rim and secure with a rubber band. Tie on a raffia or ribbon bow to cover the rubber band. Empty jar of cookie mix into a large mixing bowl. Add 1/2 cup of butter or margarine, 1 egg, and 1/2 teaspoon of vanilla. Use hands to mix the wet and dry ingredients together. When completely blended, roll into large walnut sized balls. Place on unprepared cookie sheets and use the palm of your hand to flatten each cookie ball. Bake at 350 in a preheated oven for 8-10 minute. Feel free to share your crafty ideas in the comments section. Hope these were helpful! Remember it truly is the thought that counts! Excellent ideas! My favourite is the photo collage – that is absolutely priceless. Your Dad must really treasure it. Those are all great ideas! My favorite was the picture collage you all did for your dad. Beautiful and great memories! Hope your big feast is going well today! i love the picture collage idea… I may have to whip that one up! Courtney, these are great ideas. Thank you. Those are all great idea! Thanks for sharing!!!! Those are great ideas. I love the smores gift boxes, those are so cute! Thanks for the ideas Courtney! I hope you Thanksgiving was wonderful! 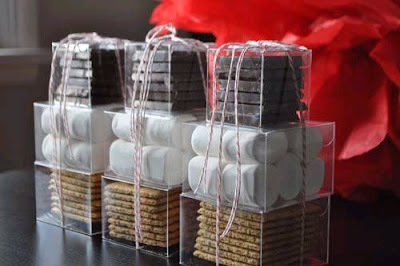 Love the s'mores all package up! How cute is that! I may do that for my girls for one night of advent! These are lovely ideas. I'm looking to do homemade and handmade ideas for Chirstmas. I *adore* the photo collage. Totally taking this one for our own… Thank you! love the SMORES idea! co cute. Thanks for some fantastic gift ideas. Goes to show that meaningful and great gifts need not be expensive. thanks for this post… I will be referring back to it! I have a new hobby – I am sewing Christmas dekoration – that is also good as a little gift! Will have it on my blog http://www.einbisschenhaushalt.de on Tuesday, but you can look on the preview post if you look up my twitter-news on the sidebar. Great suggestions! I love the country oatmeal cookie recipe..sounds awesome. Thanks for sharing. Stop over and visit me over at Free 2 Be Frugal sometime! Where did you get the clear boxes for the s'mores? So cute!! Also Check out The Monogram Divas Personalized Gifts for the perfect gift for any occasion! My favorite is the monogrammed cosmetic bags! So cute! Some lovely ideas here… definitely bookmarking this page. Especially love the “Grandpa” photo idea – my first thought was that I could coordinate this with my sister as we don’t live near each other but then also wondering how to do it with only 6 children between us! Another idea: My friend once gave me an “ice-cream kit” – a bowl filled with little bags of marshmallows, M&Ms, sprinkles etc and a long sundae spoon.